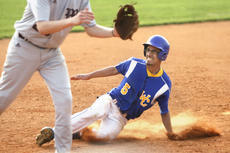 Washington County lost to Green County 15-6 on Monday night at home. Check back next week for stats and quotes from that game. Game highlights: The Indians and the Commanders battled to a scoreless tie after five innings of play. The game was called on account of rain, and will be recorded as a tie. 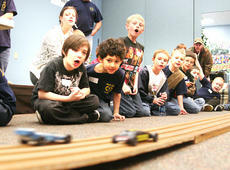 Members of Springfield’s Cub Scout Pack 429 participated in the annual Pinewood Derby Saturday afternoon at the River of Life Church. Scouts watched as two cars zoomed by on the wooden track. The top three finishers were Keith Vanover (1st place); Tyler Ashlock (2nd place); and Karson Vanover (3rd place). 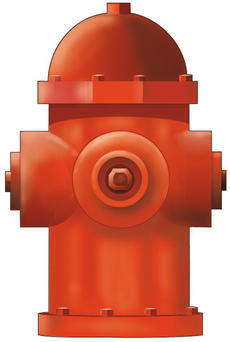 They stand about 2 feet tall, but hydrants could be a huge issue for helping many Washington County residents get a lower fire rating, and lower insurance rates. They could also be the reason local fire ratings increase, and insurance rates skyrocket, according to members of the Washington County Fire Committee. The property that was home to the Fast Food convenience store has sold. A deed in the Washington County Clerk’s office indicates that the sell was completed on March 23, 2011, and the old store location was bought by Newcomb Oil Company of Bardstown for a total of $425,000 from Haydon Coal and Oil. The Washington County Emergency Management department is rolling out a new program just in time for Autism Awareness Month. Project Lifesaver, which helps caregivers of Alzheimer’s patients and autistic children, is now available for county residents. Kevin Devine, the county’s emergency management director, said anyone interested in the program can now sign up to use the technology. Horshoe Bend Vineyard and Winery is one step closer to being allowed to sell wine on Sundays. However, if the ordinance passes, it will only effect wine sold at wineries. The third annual Hwy. 55 yard sale will make its way through Washington County this year. The 147-mile yard sale stretches through Carroll, Trimble, Henry, Marion, Shelby, Taylor, Spencer, Adair, Nelson, Russell and Washington counties. This is the first year that Washington County has promoted the event, according to Kathy Elliott with Springfield Main Street Renaissance. Tammy Osbourne with the Springfield Chamber of Commerce said space is available for people to set up at Country Place and Ace Hardware. When Lisa Nally-Martin’s first son, Evan, was born, it didn’t take long for her to realize that something wasn’t right. He was born two weeks early, and his umbilical cord had been wrapped around his neck, so she assumed that’s why he wasn’t eating properly. But, as the days and months passed, things still weren’t right. All of the typical developmental milestones that most children could do at his age, Evan wasn’t doing. BIRTH: Kelly: It's a boy! Alicia and Derek Kelly of Springfield announce the birth of their son at 9:45 a.m. on Feb. 24, 2011 at Ephraim McDowell Hospital in Danville. Evan Gregory weighed 8 pounds, 7 ounces and was 19.5 inches in length. Maternal grandparents are Rickey and Becky Burkhead of Willisburg. Paternal grandparents are Steve and Dianne Kelly of Springfield. BIRTH: Hamilton: It's a boy! Ryan J. and Allyson B. Hamilton, Louisville, announce the birth of a son on Feb. 11, 2011 at Norton Suburban Hospital, Louisville. Jackson Ryan weighed 6 pounds, 15 ounces and was 20.5 inches long. Maternal grandparents are Jack and Mary Beth Butler, Louisville. Paternal grandparents are Jerry and Rose Hamilton, Bardstown. Great-grandparents are the late Al and Mary Helen Klensch; the late Jack and Faye Butler; Kathleen Hamilton of Springfield, and the late Louis Hamilton; Ernestine Brady of Lebanon, and the late O’Shea Brady.